Background: Dectin-1 is a pattern recognition receptor that recognizes pathogenic fungi via carbohydrate moiety present on the cell wall. Single nucleotide polymorphisms in dectin-1 gene in an individual have been implicated in susceptibility to invasive infections in immunocompromised or immunocompetant host. Methods: SNPs were retrieved from dbSNP database. Five in-silico algorithms (SIFT, PhD-SNP, SNAP, PolyPhen-2 and MAPP) were used to determine the functional consequences of non-synonymous SNPs. Conservation profiling of dectin-1 receptor protein was carried out using ConSurf. 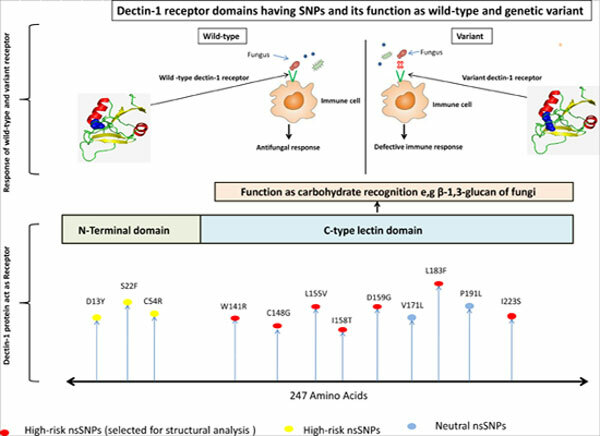 The three-dimensional (3D) structure of wild-type C-type lectin domain of dectin-1 protein was modeled using Phyre2 version-2, a web-based server. The protein stability was characterized using I-mutant tool. Results: A total of 91 non-synonymous SNPs were identified. Seven high-risk nonsynonymous SNPs in dectin-1 receptor were observed using five in-silico algorithms. Domain analysis resulted in the identification of C-type lectin domain. 3D structure modeling of C-type lectin domain as well as for seven variants of nsSNP in C-type lectin domain was carried out for determining their effect on structure-function in protein. Furthermore, I-Mutant revealed that the protein stability decreased which destabilized the amino acid interactions. The highest alteration in protein structures were observed in I223S (rs16910527), I158T (rs138005591) and D159G (rs 758623997) variants. Conclusion: We propose that these non-synonymous SNPs in dectin-1 receptor encoding gene could be considered for risk assessment against fungal infections. Multi-omic data, nsSNPs, Dectin-1 receptor, β-(1-3) glucan, C-type lectin domain, type-II transmembrane receptor.